Pediatric audiologists often find themselves working with the family of a child recently diagnosed with Autism Spectrum Disorder (ASD), or a child undergoing investigations into a possible diagnosis of ASD. Despite the wide array of presentations, it is important that audiologists understand the common audiologic implications of ASD and are equipped to administer an appropriate test battery and management plan for these children and young adults. Sensory abnormalities are a core feature of the diagnosis of ASD, which often include those of the auditory system. Despite sensorineural hearing often approximating that of a ‘neurotypical’ child, significant functional listening challenges, very often linked to comorbid language, reading and attention difficulties, are common in this group of children. Auditory processing skills in children with ASD can range from completely normal to substantially defective but generally speaking, are lower than those of age-related typically developing children. There is substantial evidence in the literature associating ASD with atypical auditory processing, at both behavioral and neural levels. Abnormalities are diverse and can include atypical processing of perceptual features such as pitch, loudness, and timing cues, as well as more complex auditory information (for example, subtle prosodic cues in language). Consequently, individuals with ASD are reportedly worse/less motivated to direct and sustain their attention towards auditory stimuli. Auditory processing difficulties are thought to contribute to academic underachievement in children with ASD, and may aggravate other challenges with inattention, hyperactivity, oppositional behaviour, anxiety and abnormal tolerance for sound/busy, stimulating environments. Recent research conducted in Melbourne (Rance et al., 2014; Rance et al., 2017), North Texas (Schafer et al., 2013; Schafer et al., 2016), and Auckland (Purdy & Leung, in prep. ) has investigated the effects of remote microphone assistive listening technology (Phonak Roger Focus ear-level receiver/s paired with a Roger transmitter) in children with ASD. 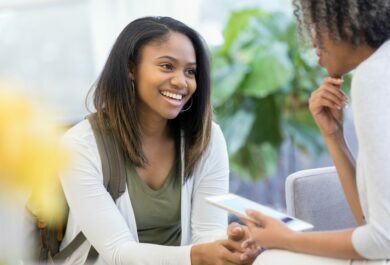 Positive results were demonstrated across a range of measures including speech perception in noise, listening challenges in the classroom, listening-related stress, social perception, and emotion processing via speech cues. Phonak is collaborating with research teams globally, to continue research in this important area, including developing a clinical model for the audiologic assessment and management of children with ASD. 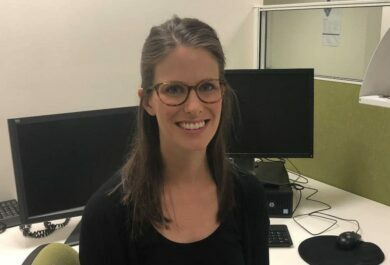 In my role as Audiologist for Autism based at the department of Audiology at The University of Melbourne, I am responsible for the design of a ‘Listening clinic’ especially for children with a diagnosis of ASD. 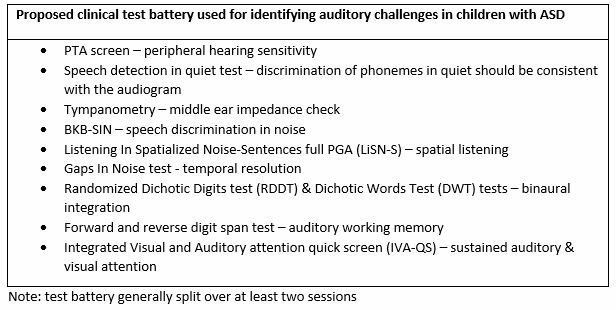 This involves developing an effective and efficient test battery to identify auditory processing difficulties, as well as investigating the effect of various management strategies with a focus on remote microphone assistive listening technology. I am fortunate to be collaborating with teams at the University of North Texas, Hearts for Hearing (Oklahoma), The University of Auckland, Sounskills clinic (Auckland) and Shanghai Jiao Tong University (Shanghai) to continue research in the audiologic management of children with ASD. Early this year, the clinical model in Melbourne will be replicated at the audiology clinic based at the University of North Texas and at Hearts for Hearing clinic in Oklahoma. We hope to be able to pool our clinical data together to analyze the effectiveness of the test battery as well as the short and long-term benefits of various combinations of management approaches. At the Listening Clinic for Children with ASD based at the University of Melbourne, parents and caregivers of children with ASD have shown great interest in having their children assessed for auditory processing skills. Additionally, they have been relieved to hear of a clinic that addresses their concerns with practical management options. If auditory processing abnormalities are identified, various management options are recommended, depending on the child’s pattern of results and main presenting concerns. The most common management strategies recommended is computer-based auditory training programs to address specific auditory processing skills such as spatial listening or binaural integration, and/or a six-week trial of Phonak Roger assistive listening technology in educational and social settings. The clinic offers trials of Phonak Roger Focus receivers paired to a Roger Touchscreen microphone, Roger Pen or Roger Clip-on microphone. 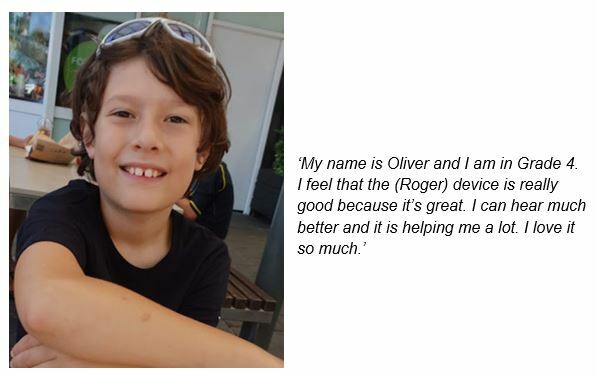 Children and their families who have trialed Phonak Roger technology have generally shown great enthusiasm for the technology. Establishing and developing the University of Melbourne-based Listening Clinic for Children with Autism over the past eighteen months has been both a challenging and rewarding experience. With a growing referral base and at least forty new families expressing interest in the clinic per month, I have had the pleasure f meeting and working with hundreds of families with children on the spectrum. This has enabled me to develop a clinical experience that suits the needs and presenting concerns of these families. The experience has given me the opportunity to tailor my clinical approach, test battery, and management recommendations to adapt to a unique and special population of people who require and appreciate our care as Audiologists. I look forward to continuing my clinical work in Melbourne, as well as collaborating with research teams in the U.S. and Auckland to facilitate expansion of the clinical model and continue research in this exciting area. Please feel free to contact me with further questions via the link below my biography. You liked this article? Then give it a (6)! Such a well written article on ear wax use of the Removing earwax from ear. https://hearme.co.nz/clinics/auckland-clinics/ is providing these services with best results. Just to get more about post about hearing aids cost. Thanks for such a nice article.